Bold and the Beautiful spoilers reveal that Katie Logan blasts Thorne Forrester as their marriage crumbles on Valentine’s Day. Bold and the Beautiful spoilers reveal that Thorne Forrester may not be totally gone. 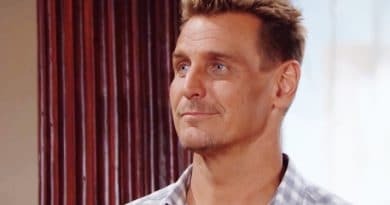 Ingo Rademacher may return to the daytime drama occasionally for big events. Bold and the Beautiful spoilers reveal that Katie Logan confides in ex Wyatt Spencer as Thorne Forrester drops a bombshell on her. ‘Bold and the Beautiful’ Spoilers: Thorne Remembers Love With Darla – Trouble With Katie? Bold and the Beautiful spoilers reveal Katie Logan and Bill Spencer begin to bond even more, which leaves Thorne Forrester feeling left out. ‘Bold and the Beautiful’: Brooke Woos Bill to Save Ridge and Katie? ‘Bold and the Beautiful’ Spoilers: Does Thorne Pull Plug on Bill’s Life-Support? 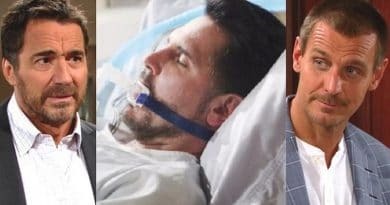 Bold and the Beautiful spoilers show Bill Spencer (Don Diamont) on life-support as Thorne Forrester sneaks into his hospital room. ‘Bold and the Beautiful’ Spoilers: Bill in Coma After Balcony Shove – Ridge and Thorne Blamed? 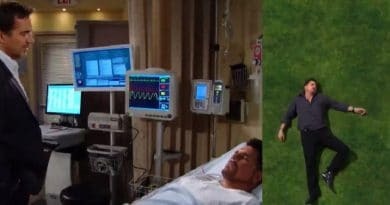 Bold and the Beautiful spoilers indicate Bill Spencer in a coma putting Ridge Forrester and Thorne Forrester in the crosshairs of the cops. Bold and the Beautiful weekly video spoiler offers a glimpse at new bride Katie and a peek at a courtroom filled with family and friends. 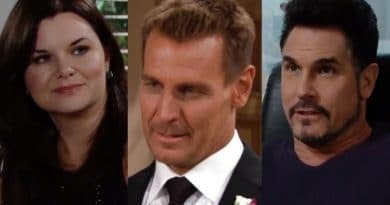 Bold and the Beautiful spoilers say Katie Logan (Heather Tom) weds Thorne Forrester (Ingo Rademacher) on September 25 in a quickie wedding. Bold and the Beautiful spoilers for two weeks hint Liam has a choice to make and more schemes are about to lead into treacherous territory. Bold and the Beautiful’ Spoilers: New Wedding, Furious Ex, and Runaway? Bold and the Beautiful spoilers suggest a fork in the road for Katie Logan (Heather Tom) when it comes to the two and a half men in her life.